How long is it going to take to close? It takes about three weeks (21 days) from the time you sign the purchase agreement until you get your money at the title company. Sometimes it takes even less time than that. The title company will schedule the closing. Any questions that you have about closing, we usually refer you on to ask the title company. We try to get you scheduled for closing as quickly as possible, but generally that is going to be subject to the title company’s schedule and availability. How do I know exactly how much money I will receive upon closing? The title company will first issue you a title commitment. This means you will be able to have a free and clear title. Then, they will send you a closing statement that itemizes all the expenses, such as the tax proration, and any judgements, and assessments, or anything like that that is owed on the property. It will itemize all those things and give you a final statement of the exact amount of money you will receive upon closing. You will be able to sign off on that before we close. Why do we need to use a title company? The title company ensures that the title is clean. It gives the buyer peace of mind, knowing that there are no back taxes, judgments, liens, etc. that would become their responsibility. Closing costs are typically $400 to $500. We cover these costs for you. What if I don’t have a clean title? To do the walkthrough and inspection, it will only take us about 10-15 minutes. It’s really quick and hassle free. Do you purchase property as-is? Yes, we purchase every property as-is. Do you purchase property while my furniture and personal possessions are still inside? 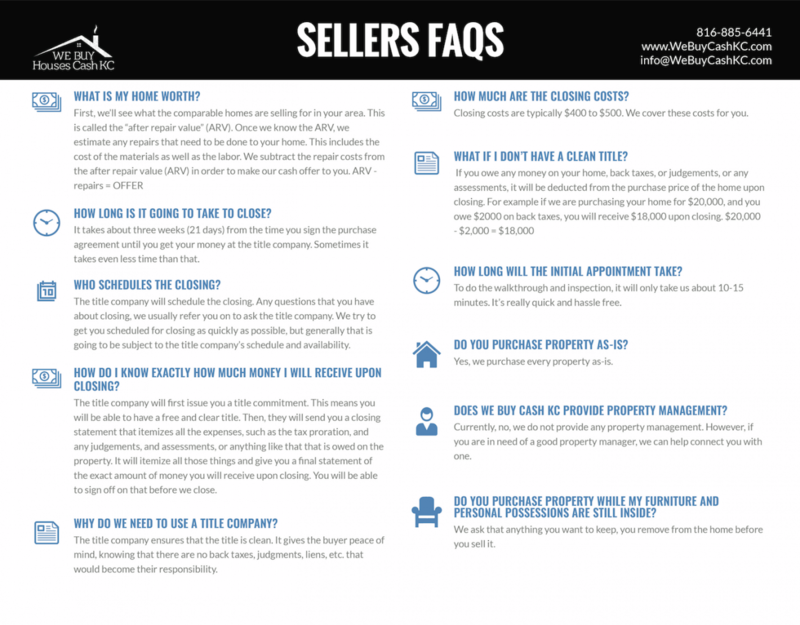 We ask that anything you want to keep, you remove from the home before you sell it. Do you purchase the property with trash inside? We prefer the house to be free of trash and debris. However, depending on the situation, we will work with you to find the best solution. Do you buy houses with fire damage, electrical problems, broken pipes? Yes. The cost of repairs will be reflected in our cash offer to you. Do I have to be moved out of my house before I can sell it? Yes, you must be moved out before you sell your home. Can I sell my home from out of state? Yes you can. The communication can be done through phone calls, mail, or email. Can you evict my current tenants for me? Will you buy the home with tenants inside? Yes, we will buy property that has current tenants. But we will need verifiable rent receipts, and a copy of the lease agreement. We will also need to know who pays utilities and how much utilities run. We will want to know how much the property taxes are. And how much the property insurance is. My home is boarded up. Can you still get in? Yes, with your permission, We Buy Cash KC can find a way into your home. Typically, we as the buyer choose the title company that we work with. The title company we work with is Alpha Title Company of Kansas City, located on 666 Red Bridge Road. Does We Buy Cash KC need to get lender approval or do formal inspections on the home? We buy vacant properties, investment properties, rental properties, including those with current tenant. We buy fixer-upper properties, inherited properties, pre-foreclosure, going through foreclosure. We buy homes or houses in which the owner are going through the divorce. We buy homes when people are relocating or moving. If you have liens, judgments or owe back taxes on your property, we can still buy your home. We buy houses in the urban core as well as suburban neighborhoods. We buy property with little to no equity in it, as well. We buy single and multifamily dwellings. What if I don’t have much equity in my home? Our strategy for a low equity home would be to try to work out a deal where you can move on to another home without damaging your credit. This works especially well in a situation where you have low equity and are facing a foreclosure. Your existing mortgage would stay in place. We would provide you with a lump sum at the time of closing. This sum would cover all the mortgage payments you are behind on, and perhaps some extra money, depending on what we agree on with you. Then, and we would begin to cover the mortgage payment each month on that home, while you meanwhile have moved on to another place to live. We can come up with all kinds of creative solutions to help you solve your problem, no matter what the situation is. Just call us and we can talk.